Are you still with me? Have you suffered a myocardial infarction and/or shat your drawers due to the sheer shock of the revelation? Well, get out the defibro paddles and/or a new set of Depends, and then keep reading. Thing is, there's nothing particularly new about me eating a steak. I've been known to eat some steakses in my lifetime. Hell, once I even bit the hell out of a Black Angus steer while it was still alive (diagnosis: delicious!). But in Argentina, the steak is supposed to be transcendently awesome at a level that belies the ability of human language to express. In some parts of Patagonia, attempting to describe the deliciousness of the steak using human language is regarded as a criminal offense against the sanctity of steak, and is punishable by five years in prison or a fine of $1000 Argie pesos (NB: the latter amounts to like three bucks, so opt for the fine). Some background on this steak that I ate. Given that this was my inaugural Bs As steak, I thought I'd go someplace nice, and wandered over to a place called "Cafe de Lector" by the Biblioteca Nacional (obv.). This was also apt for me since I was planning on reading during dinner, as I tend to do when wandering solo-style through these foreign lands, and so the name was rather apt. Plus, the restaurant is in the middle of a really nice park with statues and old-style lamps etc., so there is a picturesqueness as well. Interlude re DF's language anxiety. So far I've been doing OK in Spanish. I'd rate my performance emphatically good-not-great. When I have a chance to get into a nice longer convo with someone, it all starts working, but random bitlets of chat here and there present much bigger problems, often because these require idiomatic short phrases that I'm not so adept with. So when I'm approached by a waitstaffperson as I was tonight, I'm often antsy to make sure it all goes well, because I don't want some random Argentine person to go away thinking "That guy's Spanish is sub-par." What greater tragedy could ever befall me than that? It would be so heinous. Anyway: This waitress was lovely in many ways, including that she spoke slowly and clearly so that I could understand her, and also tolerated with Mom Teresa-like patience my various inane questions about unfamiliar words (e.g., "What's a 'borron'?" (A: it's a small bottle)). But let's focus on the steak! 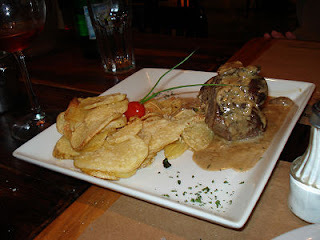 It was a lomo con champinones, which I took to be steak with mushrooms, and had a cream sauce on it. She asked me how I wanted it cooked, and I went for medium because to be honest I'm not sure how to say "medium rare" en espanol, and anyway in foreign countries they tend to cook steak one iteration rarer than they do in the US, so medium sounded about right. And the verdict... This steak? Was excellent. Cooked a bit on the rare side (so "medium", or "en punto", was totally the right call), but flavorful and filling and just what I needed after several days of eating bread + cheese here in the depto (yes, I haven't been that adventurous food-wise, and yes that's lame, and yes I promise it will change). Only drawback: there was a cream sauce with it that I could have done without. Totally detracted from the steak's deliciousness. But it's a small quibble in comparison to the overall excellence of the experienhttp://www.blogger.com/img/blank.gifce. Cafe de Lector, I am a fan of you. And I will be back to visit you sometime soon. Nor was this steak particularly expensive. I got out of there for under US$20, agua con gas y propina incluidos. The experience got DF's highest accolade: immediately afterward, I returned to the depto and found myself in such a state of satiety that I immediately undertook to siesta. True, this has led to much insomnia, but hey--twas worth it. Pictured: lomo con champignones. NB: No, the pictured steak is not the selfsame steak I ate earlier tonight. Rather, it is a stock-footage steak, because I STILL DO NOT HAVE MY IPAD WITH THE PICTURE-TAKING CAPABILITY AND WHATNOT. Sadly. PS Check what I found when I was looking for the introductory video link. Dutch techno x Anchorman = who knew?